Hundreds of tourists from around the world love to visit the capital city of Thailand at least once a year. They are attracted by the lifestyle and culture of Bangkok. You will be surprised to know there are many people who start their world tour from Bangkok. It offers a lot of attractions to the tourists. It is the most developed city of Thailand yet it has been able to preserve its history in the most authentic and amazing way. From various amazing jumping off points to the historical temples you will find a way to enjoy the beauty, freedom and adventure you will get in Bangkok. Once you will visit Bangkok you will feel like you have traveled the world. Here we have some of the reasons that why you should visit Bangkok at least once in your life. When we visit a new place the most important thing that we care about is the food that we are going to try. Whether you are foodie or not if you will not get some delicious meals you will never like to visit the same place again. However, in Bangkok you will not have such kind of issues. The reason is that from stress food stalls to 5 star restaurants you will get the best quality food products in all the places of Bangkok that makes it even more perfect. The street food of Bangkok is most delicious and flavorful. The best part is that street food is available at affordable rate that makes it even more interesting. Without spending a lot of money you can enjoy a delicious meal. The biggest attraction of Bangkok is the floating market for which many people visit the place. It is the market located on the side of a river. You will be surprised to know that the entire market is adjusted in boats and you also have to visit the market in a boat. That makes it more adventurous. All the grocery items and souvenir shops are available in the floating market. It means that you can visit the place as many times as you like and you will surely enjoy shopping in this unique way. When we travel to a different place the biggest problem we all have to deal with is management of budget. If we are unable to manage our budget properly it will get hard for us to enjoy the trip because we will not be able to get the services that we wanted in the first place. Bangkok is a perfect place to visit because you will not have to worry about your budget. All the luxurious services are available at the most affordable rates. You can even manage to live in a resort if you have enough money while you are in Bangkok. It is an opportunity that you should not miss at any cost. The nightlife in Bangkok is amazing. You can make some of the best memories because of the amazing adventures that you can enjoy. The best part is that you might visit the nightclub as a decent boy but when you will wake up the next morning you might have a tattoo on any part of your body. There are all types of clubs available in Bangkok. You can get all types of drinks and services that you want. As well as there are various tattoo artists who work in the area which makes it even more exciting. You can get all types of drinks that you want. If you truly want to enjoy the nightlife of Bangkok make sure you are ready to take some risks. Most of the people have the misconception that Bangkok is the place where they can enjoy the nightlife and some amazing food. However, you should know that there are various amazing tourists attractions in the city. The newly developed areas of Bangkok are very attractive and perfect. The huge building and attractive locations will make you stay in the place for a long time. You can enjoy various activities in Bangkok like bungee jumping, skydiving and much more while you are in town. You will have fun packed adventure where you will enjoy everything that you have ever dream about. The best thing about Bangkok is that it has not left its culture and history behind. There are many parts of the world where the government do not pay attention to the historical building due to which they are losing their appeal. However, Bangkok is the perfect mixture of modern and traditional place. Here you will find all the historical temples and buildings. They will feel like they have been newly built because the condition of the buildings have been properly maintained. That is why many people visit Bangkok because of its cultural appeal and they want to know about the history of the place. 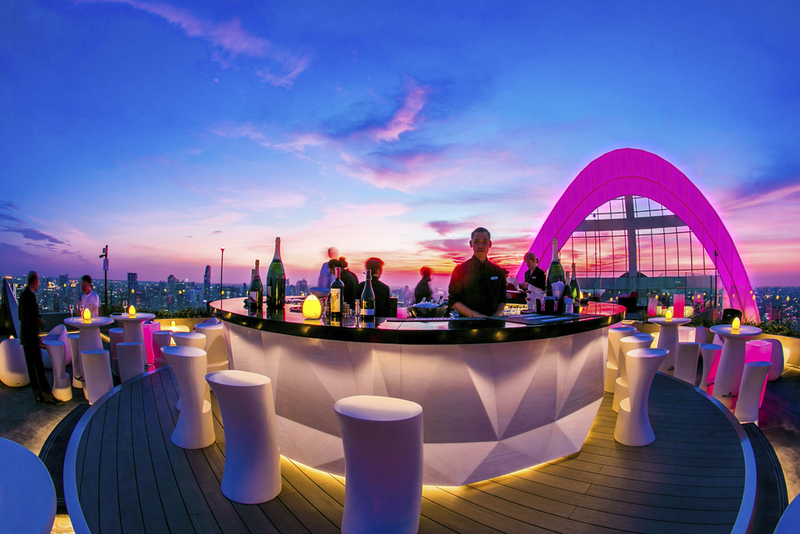 You will be surprised to see that there are many amazing rooftop bars in Bangkok. It means that you can enjoy the nightlife if you want with your friends. Such type of services are commonly booked by the friends who are planning to enjoy a bachelor’s party or they do not want to be in the hustle and bustle of the crowded bars. You will truly love the place with all the amazing drinks that will be served in a posh way. As well as you can enjoy the entire view of the city from the top. Bangkok is not only a place with some history and amazing attractions. If you are looking for a destination to relax you can select Bangkok. There are a few amazing beaches linked with Bangkok where you can enjoy the sun and sand as long as you like. As well as you can enjoy different types of water sports that will keep you engaged and happy. There are various restaurants and other places around the beach where you can spend some amazing and memorable hours if you are with family. You can also get a perfect body relaxing massage from your massage specialist near the beach. When you visit a new place and you come across rude locals you will never visit that place again. In Bangkok you will love the hospitality that you will get from the locals. They will provide you with all the information that you need regarding the addresses or the places that you want to visit. It is very easy to get information from them as well as they will be at your service if you are dealing with any kind of issue. Locals in Bangkok are very supportive and will assure to help you resolve the problems quickly, so you can enjoy your trip. The best thing about Bangkok is that you can easily get around the place without paying a lot of rent for the transportation services. If you like you can walk by foot. There are other options available as well as local carts, rickshaws and other services in which you can enjoy traveling. Once you are in Bangkok you will always find a way to get around without wasting your time waiting for the bus or other means of transportation. Once you have planned your trip to Bangkok there are various important things that you have to consider. Make sure that you always keep an extra copy of all the documents that you have to assure that you can keep your original documents safe. According to the number of days that you are planning to spend in Bangkok make sure that you plan your tour accordingly. That is the only way you will be able to enjoy the tour in the best possible way. Visit as many places as you can to assure that you can take back all the memories with you that you have made in Bangkok. Remember that there are various amazing tourist spots in Bangkok that are worth visiting. You cannot leave the city without visiting them. Your trip should be planned in such a way that you can visit all the spots in a limited time without missing out on anything.